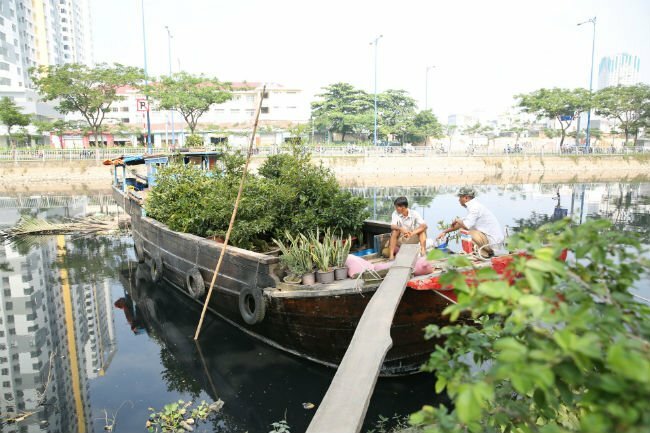 Boats with a wide variety of ornamental and bonsai plants have begun gathering at Binh Dong wharf in District 8, HCMC as the demand for home decoration for the Lunar New Year holiday (Tet) is rising. At Tet, Vietnamese always decorate their homes with flowers, so the longest annual holiday is a great business opportunity for flower farmers. Binh Dong wharf is a popular venue in HCMC where flowers and ornamental plants are gathered for sale ahead of Tet. Speaking to the Daily, vendors said they have been here for a couple of days and the wharf will be very crowded a few days before the holiday begins. There, buyers can find sago palm, ficus, yellow apricot, guava, grapefruit, plumeria, star fruit and sansevieria trifasciata plants, among others. The wharf looks like a floating flower market.